Special program on new book about women’s suffrage movement postcards at Suffrage Wagon Cafe! “American Woman Suffrage Postcards” by Kenneth Florey on Vimeo. Welcome to Suffrage Wagon Cafe, open since March 2015. Check out back programs. As I held Kenneth Florey’s book in my hands recently, I felt a surge of delight in flipping the pages for an overview of the postcard images that our grandmothers, great grandmothers and other family members may have viewed that illustrated their interest in, and in many cases, their involvement in this important American civil rights movement. Hundreds of these postcard images with scholarly commentary are now available in Florey’s 2015 book American Woman Suffrage Postcards: A Study and Catalog (McFarland, a leading publisher of academic and nonfiction books). Kenneth Florey, professor emeritus at Southern Connecticut State University, is a long-time specialist in woman suffrage memorabilia. He has lectured on the subject in the U.S. and abroad, appeared on television, and written articles for a variety of publications. Imagine my surprise when an unidentified postcard jumped off the page that only my eagle eye could have caught –that of the “Spirit of 1776,” the suffrage campaign wagon that inspired this web site. WHY THE WAGON IMAGE DISCOVERY WAS SO EXCITING! This postcard photo (shown here) is the first time the public is able to see the “Spirit of 1776” horse-drawn wagon used for suffrage movement grassroots organizing in the full context of the oceanside setting in Long Beach, NY in July 1913. That’s only one of special treats available when making American W oman Suffrage Postcards part of your library. Activists collected the postcards, exchanged them, put them into service for fundraisers and souvenirs, as well as sending messages to friends. They cover a wide range of topics, including anti-suffrage messages, the promotion of real events and programs, including actual arguments pro and con of women voting. The book production staff at McFarland shared my excitement in being able to identify the details of July 1913 not long after Edna Kearns, Serena Kearns, Irene Davison and others left Manhattan for a month of votes for women organizing on Long Island. Though the newspaper coverage of the campaign at the time was ample and other images exist of the wagon, the “Spirit of 1776” postcard in this new book from McFarland shows for the first time the horse attached to the wagon and its various patriotic protest messages. WHO’S IN THE POSTCARD PHOTO? There’s my grandmother Edna Kearns sitting in the far left of the wagon on the beach, wearing her colonial costume. Little Serena Kearns is to the far right of the wagon, at age eight. And the woman in the middle, holding the umbrella, is unidentified. Perhaps there’s someone out there with an eagle eye like mine who could identify other features and add to the fascinating detail of this picture. Here’s what McFarland’s web site had to say about the “Spirit of 1776” postcard discovery. Thanks for stopping by to join us at Suffrage Wagon Cafe. We have been offering special programs since the cafe’s opening in March 2015. Catch up on back programs. Follow Suffrage Wagon News Channel on Facebook and Twitter. Quarterly newsletters just by signing up. Suffrage Wagon News Channel has a video platforms on Vimeo. 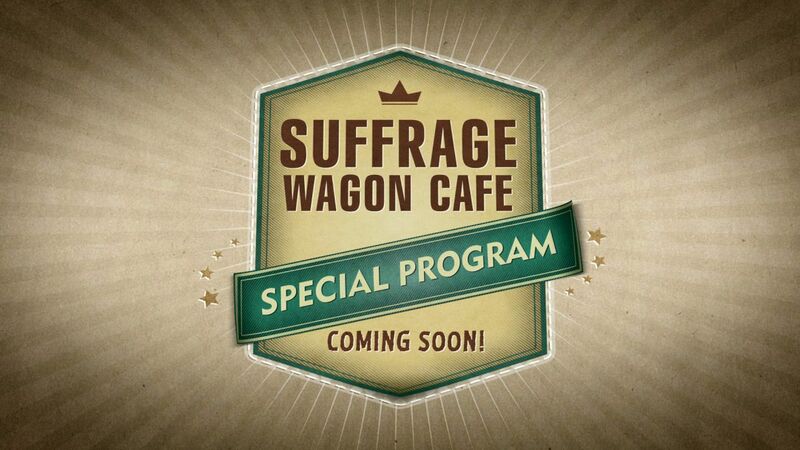 Meet your friends at the Suffrage Wagon Cafe. Follow SuffrageCentennials.com for news and views about upcoming women’s suffrage centennial events and celebrations. Become a partner during the Inez Milholland centennial during 2016. “Choose it and Use it” is a video reminding us of how the past is linked to what we do today and its impact on the future. Let’s meet at the Suffrage Wagon Cafe on Tuesday, September 8 for a special program on suffrage postcard book! Episode #4. “Spirit of 1776” suffrage storytelling. The books by Mary Wollstonecraft got Bess in trouble.